From subcompact sedans to premium saloons, in 2018 we witnessed the launch of a bunch of new and updated sedans. Here we list down the top ones that launched this year. The Indian auto industry had witnessed a growing surge of sedans in the market in the past couple of years. In 2018 alone, we saw a bunch of new and facelifted sedans being launched in the country, right from the sub-4 metre category to premium saloons. While we have already shared the best car launches and the top performance cars launched for this year, here we list down some of the best sedans that went on sale in India in 2018. 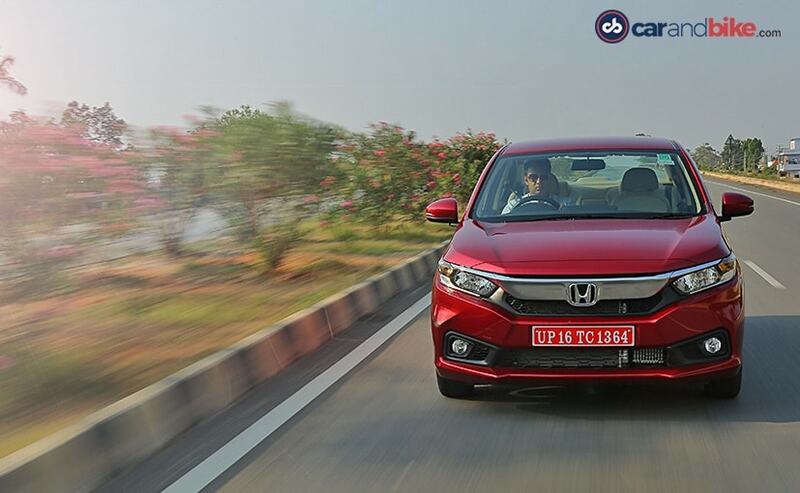 The Honda Amaze also received a generation upgrade this year, and it’s wouldn’t be an overstatement to call it an all-new car. The car is based on a new-generation platform and comes with all-new design and styling in line with Honda’s latest design language. While the car does miss out on the likes of LED headlamps or even projector headlamps, which are pretty common even in entry-level cars, but the Amaze does come with a nice road presence and CVT automatic option for both petrol and diesel variants. The engines, however, remain unchanged as the car gets the same 89 bhp 1.2-litre petrol and 99 bhp 1.5-litre diesel which come mated to a 5-speed manual gearbox and an optional 7-step CVT automatic. It also became the first in its segment to get a diesel CVT model. Along with a refreshed Tigor, Tata Motors also launched a performance spec version of the subcompact sedan, christened Tata Tigor JTP. 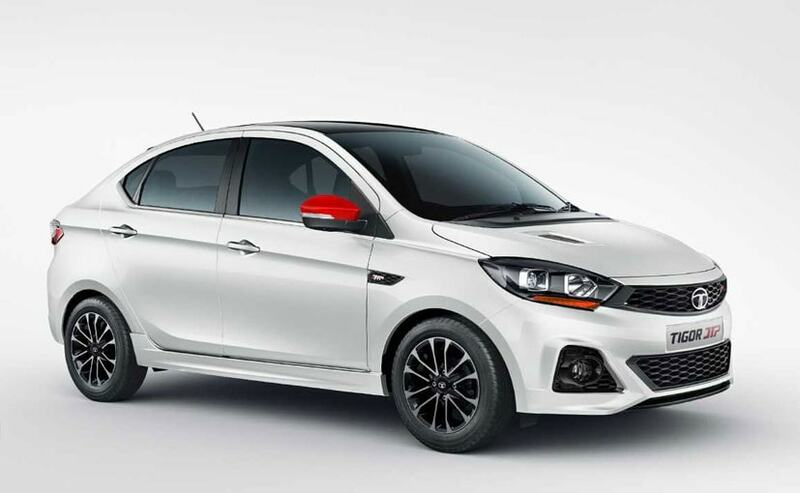 Developed in collaboration with Coimbatore-based Jayem Automotives, the new Tata Tigor JTP comes with a retuned 1.2 -litre turbocharged Revotron petrol engine which delivers 112 bhp and 150 Nm of peak torque, making it the most powerful sedan south of the sub-4 metre mark. It comes mated to a 5-speed manual transmission. Visually, the Tigor JTP comes with aggressive front bumper with large trapezoidal lower grille, dual chamber projector headlamps with chrome rings and a hood vent. The car also comes with 15-inch diamond cut dual tone alloy wheels, contrast coloured ORVMs, roof spoiler, and wider tyres. The cabin gets a base black treatment with bold red accents and matching red double stitching on the seats, and ConnectNext infotainment system by Harman’ which is paired with 8 speakers and app suite and voice command recognition. The Maruti Suzuki Ciaz received its proper mid-life facelift this year and come with a host exterior and interior cosmetic and feature upgrades. The facelifted Ciaz now comes with a new grille, updated headlamps and taillamps, and new alloy wheels. The cabin, on the other hand, gets updated interior with new upholstery, and a revised dashboard with new wooden inserts, and updated steering wheel with cruise control, and a revised instrument cluster with a colour MID display. 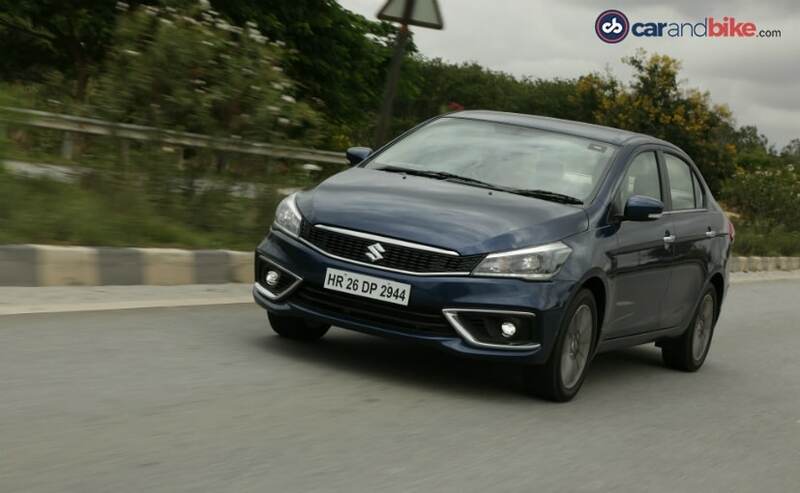 The new Maruti Suzuki Ciaz continues to get smartphone connectivity in the form of Apple CarPlay and Android Auto and Suzuki’s recently launched ‘Suzuki Connect’ telematics system. The biggest change, however, was under the hood – an all-new 103 bhp 1.5-litre petrol engine, replacing the older 1.4-litre engine, along with the tried the tested 89 bhp 1.3-litre diesel engine. Transmission option includes a 5-speed manual gearbox and an optional 4-speed AT for the petrol model. 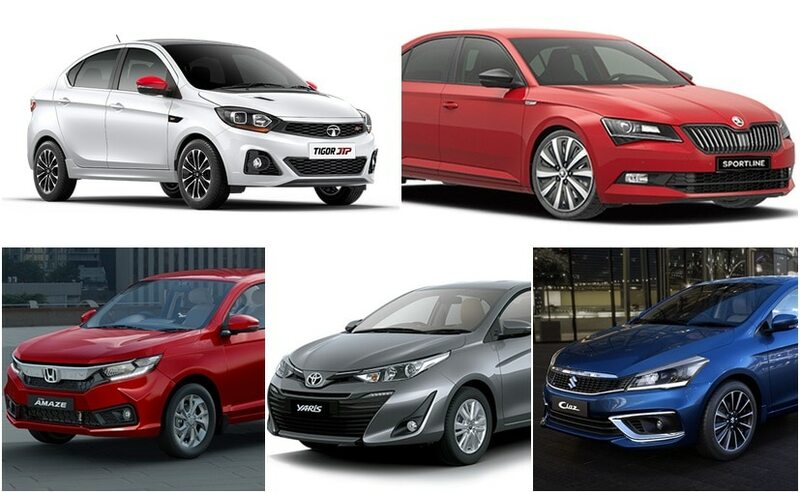 With the Toyota Yaris, the Japanese automakers finally entered into competition with the likes of Maruti Suzuki Ciaz, Honda City and Hyundai Verna. 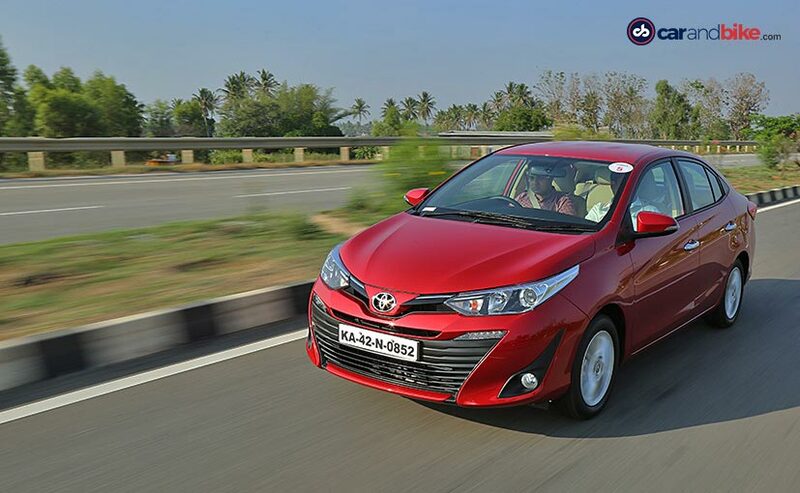 The Yaris is an all-new model for the Indian market and is based on the globally sold Toyota Vios. Unlike its competitors, the Toyota Yaris is offered only in petrol option, powered by a 1.5-litre petrol engine that churns out 108 bhp of max power and 140Nm of peak torque, and comes mated to either a 6-Speed manual gearbox or an optional 7-step CVT automatic gearbox. The Toyota Yaris also the only model in this segment to offer a CVT automatic version under ₹ 10 lakh mark. The Yaris also comes with 8-way adjustable power driver seat, flat floor for the rear section, glass-high solar energy absorbing (HSEA) and tyre pressure monitoring system. Furthermore, it also gets 7 airbags including curtain and knee airbags, front parking sensors, rear parking sensor with a camera, ABS with EBD, stability control and disc brakes for all four wheels. This year Skoda launched the 2018 Superb Sportline model in India, which came with similar treatment to the Octavia VRS in the looks department. 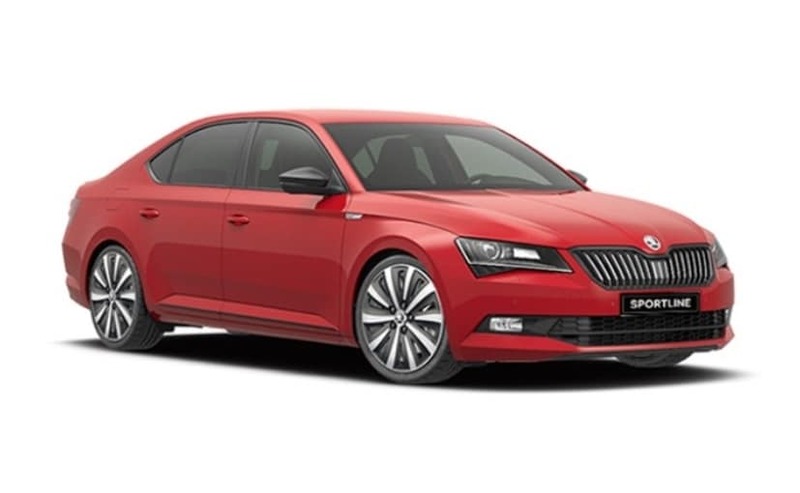 The new Skoda Superb Sportline is the mid-spec variant and has been slotted between the Style variant and the range-topping Lauren and Klement trim. The new Skoda Superb Sportline comes with a host of cosmetic changes on the outside which include a glossy black grille and rear lip spoiler, gloss black treatment on the approach angle and sides, a matte black rear diffuser that sports chrome exhaust pipes, 17-inch dual tone Drakon Alloy wheels and Sportline badging. Offered in both petrol and diesel, the Skoda Superb Sportline trim, gets the same 180 bhp 1.8-litre TSI petrol and 177 bhp 2.0-litre TDI oil burner under the hood.